TOKYO -- Nissan Motor Co. CEO Carlos Ghosn said the nation's second-biggest automaker will stick to its domestic output target even as the yen's strength may damp manufacturing in Japan. "What I worry about is not just Nissan, but Japanese manufacturers losing motivation to maintain production in Japan," Ghosn said Saturday at the carmaker's wharf in Yokohama. "The high yen is definitely a headwind." Larger Toyota Motor Corp. has also said it will rely on leaner manufacturing methods, rather than moving production offshore, to cope with the yen's 9.6 percent climb versus the dollar in the past 12 months. Ghosn said Nissan, which expects the yen's gains to slash 135 billion yen ($1.7 billion) off operating profit this fiscal year, intends to produce 1 million cars a year in Japan, unchanged from its previous target. 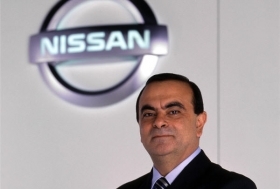 "This goal is a choice Nissan has made, and has maintained through a collaborative effort with our suppliers," Ghosn said. Nissan's May global output rose 19.3 percent to 368,914 vehicles, with a 0.8 percent increase in domestic output and 25.7 percent increase in overseas output. Global output for Toyota fell 49.3 percent to 287,811 units. Nissan forecasts production for the year ending March 31 to reach 4.6 million units, up 11 percent from a year earlier. Nissan made less than 30 percent of its vehicles in Japan last year, compared with 43 percent for Toyota. Ghosn reiterated an earlier forecast for global production to fully recover by the beginning of October. Nissan now targets operating income of 460 billion yen ($5.8 billion) in the year ending March 2012, while Toyota expects 300 billion yen and Honda estimates 200 billion yen. That would be the first time Nissan beat its two biggest competitors, according to Bloomberg data dating to 1992. Nissan estimates its global vehicle sales will rise 10 percent to 4.6 million vehicles in the 12 months started April 1, compared with a 6 percent decline forecast by Honda and 0.9 percent drop at Toyota. Ghosn also said Saturday that the automaker will introduce a new pickup truck in India this month with its partner Ashok Leyland Ltd. The company had previously said it would bring on the new vehicle sometime in the July to September quarter.